​In the spirit of making both good eating and reading a part of every healthy childhood, the following is a quick book-related look at the well-defined developmental milestones of early literacy. Unlike solid foods, it is never too early to start reading with your baby. Who cares if it’s the sports page or Elmo—it will be the time you share together that counts, so have fun with it! 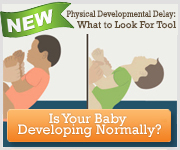 Whatever babies are interested in at this age, they predictably put straight in their mouths. Books are no exception. Now that your baby can sit in your lap; grab for a book; and show his or her interest by batting at, turning, or gumming the pages, you’ll find yourself especially appreciative of board books for their drool-proof nature. As with food, your child will now figure out there’s a lot more he or she can do with books than just put them in his or her mouth. As he or she makes a point of holding them, turning them right-side up, and carrying them to you to read time after time, you can start relating what’s in the books to his or her real-life experiences—pointing to pictures and asking simple yet pointed questions like, “Where’s the pea? Can you find the pea?” Before you know it, your child will be answering your questions, filling in the ends of each sentence, and reciting the stories back to you. As with meals, don’t expect a long attention span, since it’s the quality of the time spent that really matters, not the quantity. Two-yea​r-olds thrive on routine and love to master the power of predictability, so don’t be surprised if yours is less than willing to try something new and instead wants to read the same story over and over (and over) again. If bedtime books have now become a habit—great! This is one habit you’ll never need to break.